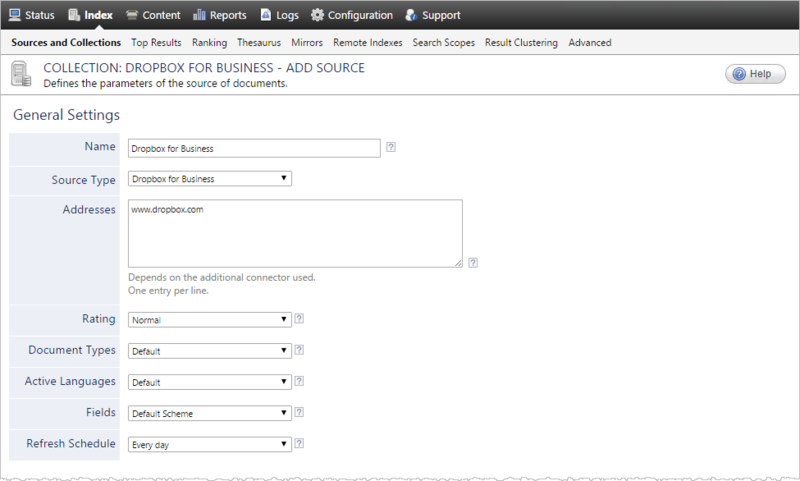 A source defines a set of configuration parameters for a specific Dropbox for Business account. Select Index > Sources and Collections. Select an existing collection in which you want to add the new source. Click Add to create a new collection (see Adding a Collection). In the Sources section, click Add. The Add Source page that appears is organized in three sections. Enter a descriptive name of your choice for the connector source. Select the connector used by this source. In this case, select Dropbox for Business. Note: If you do not see Dropbox for Business, your environment does not meet the requirements (see Dropbox for Business Connector Requirements). This parameter is not used, but must not be empty. Enter http://www.dropbox.com. Select the field set that you created for your Dropbox for Business source (see Dropbox for Business Connector Deployment Overview). Time interval at which the index is automatically refreshed to keep the index content up-to-date. By default, the Every day option instructs CES to refresh the source everyday at 12 AM. Note: Normally the incremental refresh takes care of maintaining the source up-to-date, but due to a Dropbox API limitation, it is recommended to perform a full refresh per day. Because the incremental refresh takes care of maintaining the source up-to-date, you can select a longer interval such as Every Sunday (see What Should Be the Frequency of Source Refresh Schedules?). Change this value only when you want to globally change the rating associated with all items in this source relative to the rating to other sources (see Understanding Search Results Ranking). Example: When a source replaces a legacy system, you may want to set this parameter to High, so that in the search interface, results from this source appear earlier in the list compared to those from legacy system sources. If you defined a custom document type set for this source, select it (see What Are Document Type Sets?). If you defined custom active language sets, ensure to select the most appropriate for this source (see Adding and Configuring a Language Set). Due to a Dropbox API change, this option is no longer supported. CES 7.0.8996+ (June 2017) A source rebuild will remove existing indexed file revisions (if any). Whether file revisions are indexed. The application token to use that you previously obtained (see Authorizing the Coveo Connector to Access the Dropbox of Your Team Members). Note: The app key is a series of 15 alphanumeric characters. The application secret to use that you previously obtained (see Authorizing the Coveo Connector to Access the Dropbox of Your Team Members). Note: The application secret is a series of 15 alphanumeric characters. The access token secret to use that you previously obtained (see Authorizing the Coveo Connector to Access the Dropbox of Your Team Members). Note: The access token secret is a series of 15 alphanumeric characters. This parameter is not taken into account for this connector. When selected, CES indexes all the document metadata, even metadata that are not associated with a field. The orphan metadata are added to the body of the document so that they can be searched using free text queries. When cleared (default), only the values of system and custom fields that have the Free Text Queries attribute selected will be searchable without using a field query (see Adding a Field to Search On and What Are Field Queries and Free Text Queries?). In CES, the custom field CorpDepartment is bound to the metadata Department and its Free Text Queries attribute is selected. When the Index the document's metadata option is cleared, searching for RH returns the document because a field is indexing this value. Searching for hector does not return the document because no field is indexing this value. When the Index the document's metadata option is selected, searching for hector also returns the document because CES indexed orphan metadata. Ensure that this option is selected because Dropbox team member IDs are case sensitive. When you select this check box (recommended), at indexing time, CES creates HTML versions of indexed documents. In the search interfaces, users can then more rapidly review the content by clicking the Quick View link rather than opening the original document with the original application. Consider clearing this check box only when you do not want to use Quick View links or to save resources when building the source. Leave this check box cleared (recommended) so that in the search interfaces, the main search result link opens the original document with the original application. Consider selecting this check box only when you do not want users to be able to open the original document but only see the HTML version of the document as a Quick View. In this case, you must also select Generate a cached HTML version of indexed documents. When you chose to index Dropbox permissions, in the Security Provider drop-down list, select the Dropbox for Business security provider that you created for this source (see Configuring a Dropbox for Business Security Provider). CES 7.0.8047+ (December 2015) In the Authentication drop-down list, select the Dropbox for Business user identity that you created for this source (see Dropbox for Business Connector Deployment Overview). Click Save to save the source configuration. In the navigation panel on the left, click Permissions. In the Permissions page, select Specify the security permissions to index. In the Allowed Users and Denied Users boxes, enter the users and groups that you respectively want to allow or deny to see search results from this source. The default is to allow everyone \S-1-1-0\ (Active Directory Group). When you are ready to start indexing the Dropbox for Business source, click Rebuild. In the navigation panel on the left, click Status, and then validate that the indexing proceeds without errors. Open the CES Console to monitor the source building activities (see Using the CES Console). Set an incremental refresh schedule for your source (see Scheduling a Source Incremental Refresh). Consider modifying some hidden source parameters to try resolving other issues (see Modifying Hidden Dropbox for Business Source Parameters).